As I try using various plants as a source of dye, I am realising how many shades of brown there are !!! 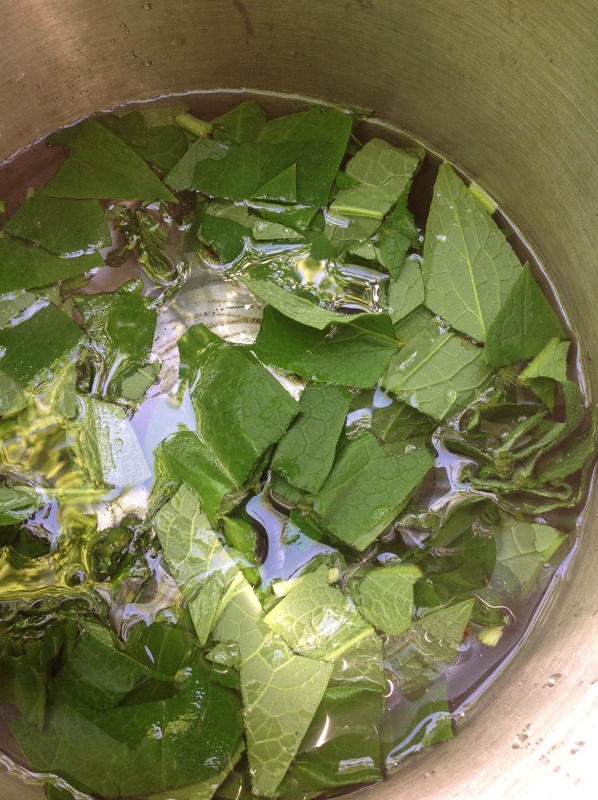 Over the weekend, I did a dye vat of Comfrey. Comfrey (Symphytum officinale) is a flowering plant often found in older gardens. It is a useful plant for gardeners … as a fertilizer, it contributes impressive amounts of nitrogen and potassium. As a compost component, it adds heat and moisture, and helps to speed up the composting process. 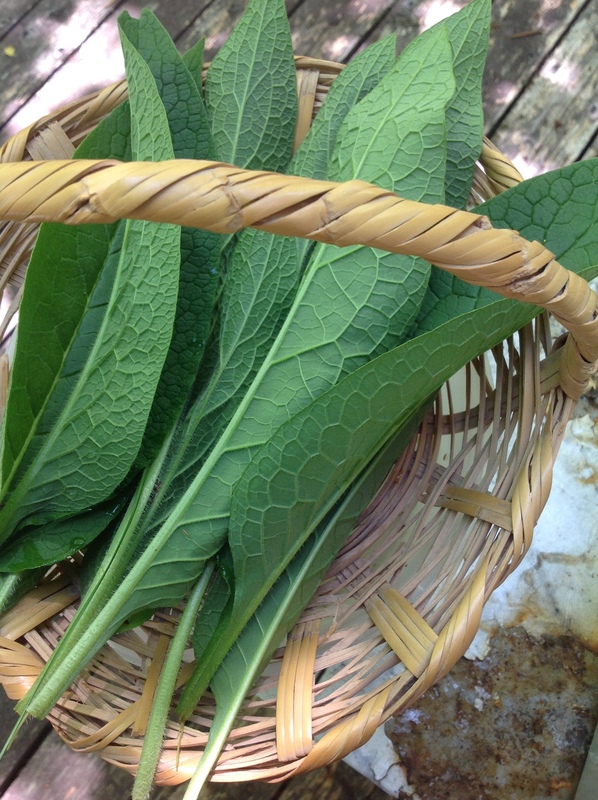 In the past, Comfrey was recommended as a tea and a medicinal. However, the plant contains alkaloids. Taken internally, these can cause severe damage to the liver and, in Canada, the sale of products containing Comfrey is prohibited. 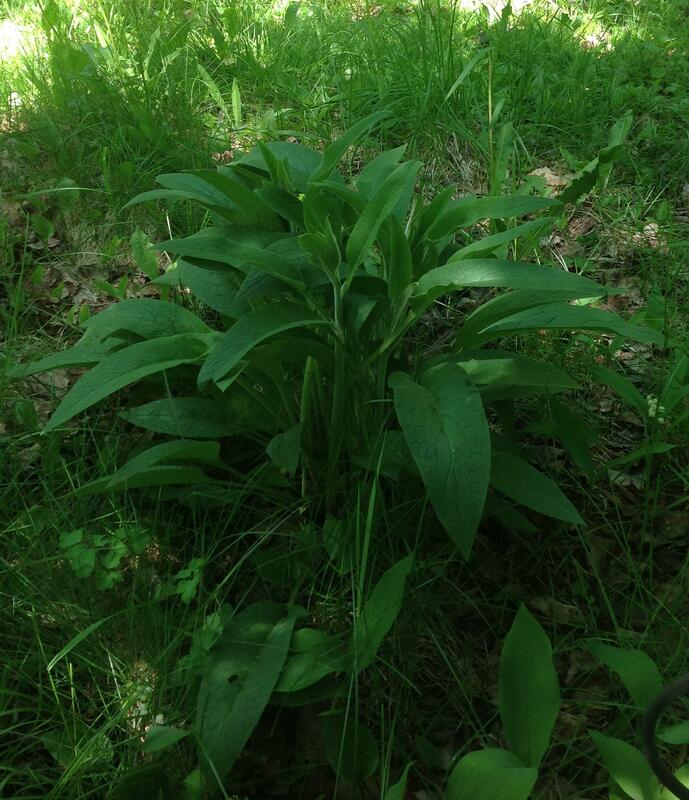 Comfrey grows in large clumps of linear leaves, up to a meter tall. Its stately foliage provides a great backdrop for smaller plants. Later in the season, it will produce curved clusters of bluish-purple flowers. I strained and discarded the leaves (in my compost of course) and allowed the liquid to cool. 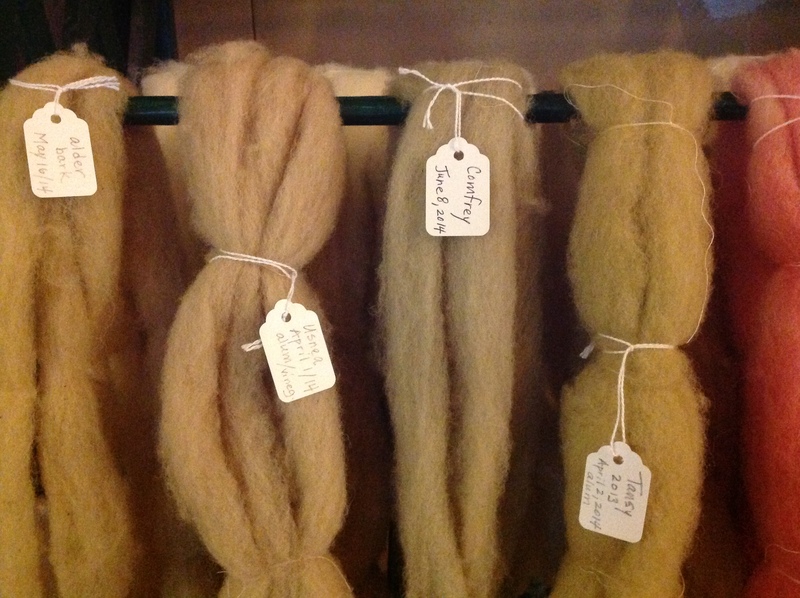 Then I added some of my wool roving, pre-treated with alum, and simmered the wool for about an hour. 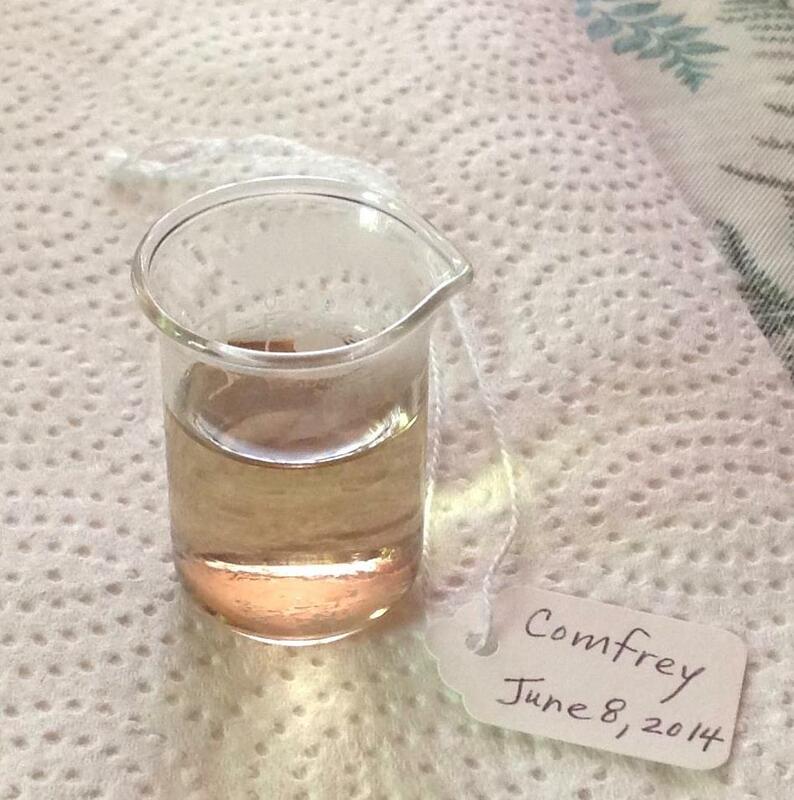 The Comfrey brown is a brown of the forest, without the orange or yellow undertones of the other browns I have made. This is the brown of the wild rabbit I saw in our driveway last week. It is the buff brown of the heads of Pine Siskins visiting our bird feeders in winter. This brown reminds me of soft mitten wool and caterpillar cocoons. From Comfrey comes a very comforting brown. Although I could use my wool roving ‘as is’ in my weaving, I have decided to spin the wool. First, of course, I have to learn to spin. A maple drop spindle should be waiting in my mailbox later in the week. So many projects … good thing the days are getting longer !!! Your posts are helping me learn how to discriminate between (and appreciate) the many different delicate shades of brown. I never thought about it until you mentioned it, but with so much green in nature, it’s somewhat surprising that it’s difficult to find a plant that will make a green dye. You do have a lot of projects going on! It is amazing how many shades of brown they are, and how some are more appealing than others. One of my favorite dresses as a child was a lovely shade of brown, but most of the browns I come across are rather blah… I can see why you find the comfrey shade so comforting. Wow! Spinning wool? What an adventure! You always have so many projects on the go. And whatever you write, there is music, a lilting cadence, the comfort of repetition of words and sounds, a poetic rhythm. You make the world a more wonderful place because you’re in it.